There is a unifying concept behind all the various projects I've written about lately on my Google Collection. It's building up for a setting called the Samoora Sea. Here are the projects and ideas I'm mentioned recently on G+ with the underlying idea. The spells broken up by color project deals with Salt Magic, a style based around the region named Camalanth. This region is home to 99.9% of the mines for Five Color Salt. Normally, the colored salts are used for seasoning food, but a few gifted individuals can use the salt to perform magic. In the project, the colors will help determine spells available in that style. On the island of Porta Nile, live the crabmen. The Crabmen's gleaming metal tower is rises above the dense jungle and is visible from miles. A colony of humans and other friendly species live on the northwest corner of the island. Most are escaped prisoners of the crabmen with a few shipwreck survivors. To defend themselves from the Crabmen and their alien devices, the survivors have taught themselves a peculiar magic style based on charts and runes. Penfro is considered the last outpost of civilization in Camalanth. 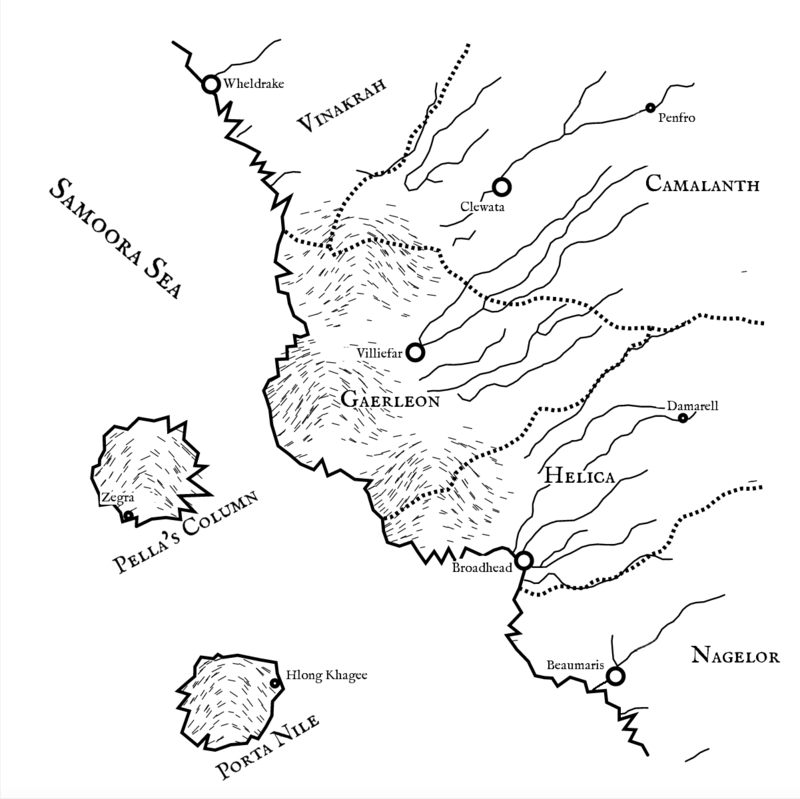 East of Penfro lies a barren wilderness that separates the Samoora Sea from the Eastern Kingdoms. Gambling is common, especially during boom times. Dice and card games are the most popular forms. A strange religion is found here called the Cult of Hot Iron. Ritualized duels and magic based on generating walls and containers are its two main features. Inspiration for The Cult of Hot Iron comes from this book. In Gaerleon are many gates connecting to far-flung cities and locales. Villefar is more commonly known as The City of Pathways. It is believed that if you can reach Villefar, you can even travel to the stars. This November, I will be working to put the pieces together.